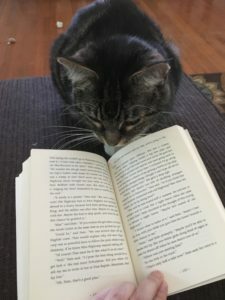 There are actually 12 books in the Wolves Chronicles, but when I was a kid I only read six of them, and these were the six that I recently reread and am reviewing: The Wolves of Willoughby Chase, Black Hearts in Battersea, Nightbirds on Nantucket, The Stolen Lake, The Cuckoo Tree, and Dido and Pa. The series takes place in alternate timeline in 1800s England (in this timeline, James II was never deposed in the Glorious Revolution, and so throughout the books his descendants sit on the throne of England. The other main difference is the number of wolves in England–the country is overrun, and the threat of wolves is a convenient plot device in many of the books). Mainly, the books revolve around two friends, Simon and Dido, and their adventures as they repeatedly thwart a group of “Hanoverians” who want to kill James III (and later his son) and put “Bonnie Prince Georgie,” a pretender, on the throne. Wolves of Willoughby Chase: Cousins Bonnie and Sylvia Green are left in the care of a villainous governess who wants to use them in her diabolical get-rich-quick schemes. The girls, with the help of the resourceful gooseboy Simon, attempt to escape her and thwart her plans. 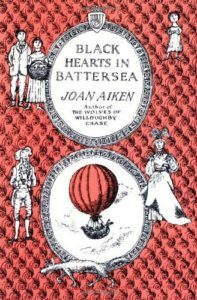 Black Hearts in Battersea: Gooseboy Simon moves to London to make his fortune and study painting. While there, he rents a room from the Twite family. As he grows accustomed to London and searches for his friend Dr. Field who has mysteriously disappeared, he slowly learns that the Twites are not quite as harmless as they appear. Simon, his friend Sophie, and Dido Twite, daughter of his landlords, successfully help Sophie’s boss, the Duke of Battersea, sidestep a number of murder plots (these plots are fairly Scooby-Doo in their execution). Eventually Simon realizes there is a plot to kill King James III that only the three of them can stop. Nightbirds on Nantucket: Dido, who was lost at sea at the end of the previous story, has been picked up by a Nantucket whaling ship. Brought to Nantucket, she befriends the daughter of the ship captain and helps her deal with a terrifying guardian, Aunt Tribulation. Dido also uncovers yet another plot against James III, this one involving a giant cannon on Nantucket aimed at London, and realizes that Aunt Tribulation is not exactly who she says she is. The Stolen Lake: On her way back to England, Dido and the ship she is aboard (the Thrush, led by Captain Hughes) are rerouted to New Cumbria (a fictional country in South America) to give aid to the queen there. This is the first book in the series with fantasy elements. The queen of New Cumbria tells them that her lake has been stolen by the king of a neighboring country, and requests their help in getting it back. Dido soon realizes that the queen and her ministers cannot be trusted, but the full scale of their villainy is not revealed til the end of the novel. The Stolen Lake contains elements from the King Arthur legend as well. The Cuckoo Tree: Finally back in England, Dido just wants to get back to London and try to find Simon and Sophie. However, she’s traveling with Captain Hughes, who has an important dispatch for King James III. When he’s taken ill, she’s stuck in the creepy little town of Petworth, with no one to trust. Surrounded by eccentric folk, she soon finds herself tangled up in yet another plot against the King, this one with vaguely magic overtones. When the old king dies and his son’s coronation is scheduled, Dido must race against the clock to prevent the Hanoverians from going through with their dastardly plans. Dido and Pa: Simon and Dido are at last reunited, but not for long. Dido is soon kidnapped by her pa, who wants to involve her in yet another Hanoverian scheme: this one involving a parade, lookalikes, a newly build tunnel leading out of London, and the evil Margrave of Nordmarck. Once again, Dido must use all her wits to outsmart the evil grownups and save the King. As you can see, the books all follow a simple formula: enterprising youth realizes the adults around him or her are bad, and successfully outsmarts them. For this reason, these books are all very satisfying reads. The bad guys get their comeuppance, the good guys win, and order is restored to the universe. The series gets darker and darker as it goes along–in The Wolves of Willoughby Chase, the bad guys are merely arrested. In Black Hearts in Battersea and Nightbirds on Nantucket, many of the bad guys die but it all happens offstage. By the time you get to Dido and Pa, however, the baddies are getting eaten alive by wolves. Dido and Pa and The Stolen Lake are particularly grisly, but all the deaths happen quickly and are not needlessly dwelt upon. The real joy of these books, and the best thing about them, is the character of Dido Twite. As a young adult protagonist, Dido is obviously smart and resourceful, but she’s also witty, sharp-tongued, and brave. She’s one of my favorite characters in children’s literature. Dido gets scared of things and doesn’t always know what to do, but she never lets her fear show when she’s confronted by yet another bad guy. She does what needs to be done, is loyal to her friends, and has a way with words that is frequently hilarious. I loved these books, and Dido, when I was a kid, and I was glad to find upon rereading that they are still fun and enjoyable to read. I can’t speak for the other six books in the series (most of which were published after I was too old for them), but these ones are a lot of fun. Share the post "Wolves at the Door"